Looking for a new block? Look no further! This lattice quilt block is quick, but looks great. Rachel did a great job picking floral fabrics, a great choice for her lattice theme. What fabrics will you choose? "This tutorial yields (4) 6" finished blocks. 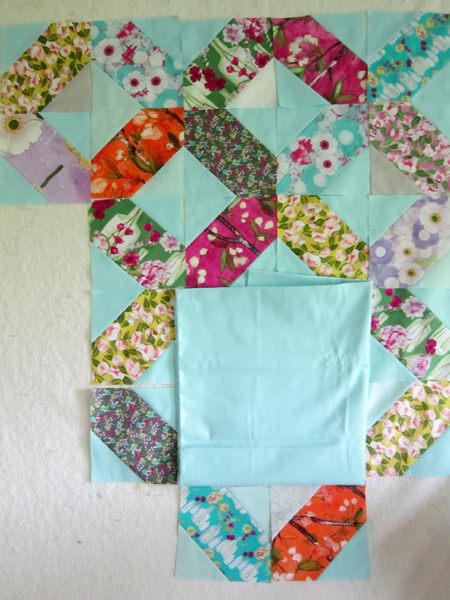 Sew all four blocks together to create a 12" finished "X" shape. I am not joining my 6" blocks until the end so that I can rearrange blocks as desired. To add variety, I may interrupt my quilt now and then with solid "background" blocks in either 6.5" or 12.5" cut squares. Mix it up as you like! "